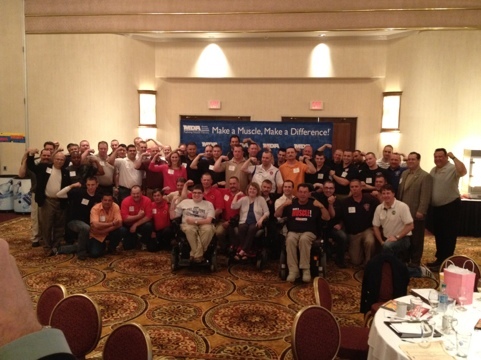 Hello and Welcome to the 2012 MDA Boot Camp for Upstate New York Firefighters. I am Joy Parker, this year’s MDA Personal Achievement Award Winner, and I am honored to be the first to welcome you to this incredibly important event. In August of 2011, three months after I was first asked to speak at this event, I suffered a pulmonary embolism. A blood clot became lodged in my aorta. These clots are an unfortunate side effect of not being as mobile as I used to be. It began simply as a shortness of breath and feeling a little weak. Dizzy. I was at work at the time and my quick thinking co-workers called 911. And within 2 minutes, a whole truckload of firefighters were around my little cubicle saving my life. the exact thoughts of a person as they go through such a near-death experience. And those honest thoughts in my head may surprise you. Which brings me to today. I am so grateful to be with the finest, (and best looking) firefighters in Upstate New York-without the drama of not being at my best! I am a testament to the quick-actions of Engine 13, Battalion 2 in Rochester, NY and for allowing a little humor into an otherwise dark moment in my life. I am here to thank you for your support of the MDA Boot Drive campaign, and to share with you how important they are to someone like me. I have ALS, otherwise known as Lou Gehrig’s Disease. I am in a rare group – a woman under the age of 45. For me, that can be a lonely place to be sometimes. In this area, there is only one other woman my age with ALS. Although we “talk” now and again through email, we don’t connect face-to-face. She uses a ventilator and cannot speak. It can be daunting and scary at times to have a terminal illness like ALS and feel so isolated. Those are the times when it would seem easiest to give up. Just like, I imagine, how it must feel sometimes when you collect for the MDA. The weather does not always co-operate. Neither do the drivers as they dash by, preoccupied with their own lives. And many who do stop, no longer have the spare change they used to in this age of debit cards and on-line banking. All I know for sure is as long as I am here, I can help. And if I can help from this chair, then certainly so do you with your boots. When you raise money, in any amount, you aren’t just helping to buy the expensive, durable goods, or medicines. You are buying someone like me the most precious gift of all – time. The spare change you collect when spent locally, helps to pay for an MDA Clinic at the University of Rochester Medical Center. There, I can meet with all kinds of specialists to help me with my treatment. Neurologists, Physical Therapists, Rehabilitation Nurses, Speech and Mobility Professionals. The clinic centralizes all of these professionals into one location for me rather than me having to travel all over to see them. That also gives me time. ALS is not a painful disease, but it is an exhausting one. So any energy I can conserve allows me to concentrate on the important things. Time to spend with my family – and with you here tonight. The funds from the Boot Drive buys me time. An hour with a caregiver. A few minutes with a specialist. Or a shared moment with another ALS patient. Your efforts are incredibly important. Your Boot Drives creates awareness. Remember that when you collect those dollars – and cents, you are literally buying me, and the thousands of others who suffer with a neuromuscular disease: time. Something you can’t put a price on.